News flash! Erik Agard will make his Jeopardy! debut next Friday, October 19. Set your DVRs! We’ve got a bit of a mini-theme and visual aspect here. The grid’s black squares depict a LIGHT BULB, 49a. 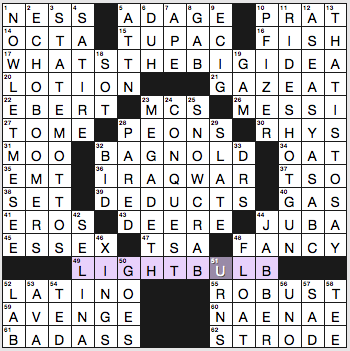 [Item suggested visually by the black squares in this puzzle’s grid] (plus some 2- and 3-square black bars needed to make the grid fillable), and the 15 at 17a, “WHAT’S THE BIG IDEA?“, feels quasi-thematic since a cartoonist might use a light bulb above the head to indicate a bright idea. 2d. [Millennials, in relation to their parents], ECHO BOOMERS. 11d. [Not be in the driver’s seat], RIDE SHOTGUN. 23d. [Heavy metal band with the double-platinum album “Countdown to Extinction”], MEGADETH. An apt album title! The plural XINGS looks nutty, but nothing else jumped out at me in the negative. How’d you like the puzzle? Four stars from me. Phrases with a word ending in -CK have that C changed to an S. There’s no revealer to give any reasoning behind the change. 24a [Loon, at times?] DUSK CALLER. Duck… This entry revealed the fact that I know nothing about loons. 36a [Do some ’80s Sochi sunbathing?] BASK IN THE USSR. Back… Weird clue in that you’d need a time machine in order to fulfill it. Speaking of which, did you all see the new Dr. Who? I think Jodie Whittaker did and will do a brilliant job in the role. 49a [Hitchhiking and texting?] THUMB TASKS. …tacks. This one got a chuckle out of me. 59a [What young elephants do for fun?] NIP AND TUSK. …tuck. Tusk as a verb? This all worked reasonably well. Maybe not a lot of excitement in the theme, but the wordplay is consistent and solid enough. Very nice fill, especially in the corners: COROLLAS, OVERLAPS, and DIAMETER in the NE and BATH SOAP, ACTUALLY, and SHIMMIES in the SW. The other two aren’t so bad either, though BESSIE (47d, [Blues great Smith]) is not known to me. 40a. [“The Well-Tempered Clavier” composer]. BACH. I’m not familiar with the title, but have certainly heard parts of the piece especially the prelude which seems to be popular at weddings. 3d [Consumer-friendly?]. EDIBLE. Nice play on words there. 4d [Hedge opening]. YES, BUT. Tough clue, but I like it and the entry. 37d [If truth be told]. ACTUALLY. Shouldn’t there be quotation marks around that clue? 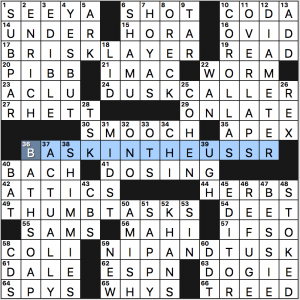 45d [One slightly changed this clue]. EDITOR. I wonder what the original clue was. [20a: Carson adventure with elements of Roald Dahl? 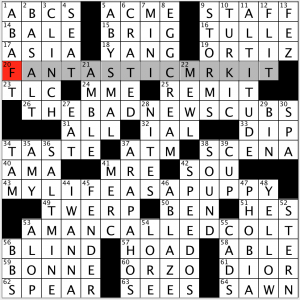 ]: FANTASTIC MR KIT. Fantastic Mr. Fox (2009), stop-motion animation adaptation of the 1970 Roald Dahl novel, directed by Wes Anderson; Kit Carson, “mountain man” and “Indian Agent” (aka instigator of genocide). [26a: Documentary of futility at Wrigley Field with a nod to Walter Matthau? ]: THE BAD NEWS CUBS. The Bad News Bears (1976), starring Walter Matthau, remade in 2005 with Billy Bob Thornton; the Chicago Cubs won the World Series in 2016 after 108 years passed since their last win. [43a: Story of Lassie’s early days directed by Lasse Hallström? ]: MY LIFE AS A PUPPY. My Life as a Dog (1987), a Swedish coming-of-age film directed by Lasse Hallström; Lassie was a collie who appeared in films and a television series starting in the 1940s. [53a: Peyton Manning biopic whose title evokes Richard Harris as an adopted Sioux? ]: A MAN CALLED COLT. A Man Called Horse (1970), a “white savior” film starring Richard Harris as an English nobleman captured by the Sioux; Peyton Manning played for the Colts until 2011. Cute idea! Other potential entries that our constructors likely discarded include: A LARVA’S LIFE, SHAUN THE LAMB, CHICK RUN, KITTEN ON A HOT TIN ROOF, JOEY JACK, THE CATERPILLAR EFFECT, and THE BAMBI HUNTER. Fill-wise, it was interesting to me that there wasn’t much more contemporary than [35d: Schumer or Sedaris of comedy]: AMY (also pretty much the only women in the grid). I hadn’t heard of [57a: 1950s Wimbledon champ Lew]: HOAD, and when I think of songs beginning with I WANNA, [44d: “___ Be Around” (1963 Tony Bennett hit)] is not what comes to mind. If you don’t live in, or haven’t spent time in, New York City, or if your Grandma didn’t take you to the Pickle Barrel Deli near her condo in Deerfield Beach, you might not know that an [8d: Fizzy fountain order with flavored syrup]: EGG CREAM contains neither eggs nor cream, but is rather made with Fox’s U-Bet chocolate syrup and seltzer. This entry was posted in Daily Puzzles and tagged Andrea Carla Michaels, Bruce Haight, Ed Sessa, Erik Agard, Mark McClain. Bookmark the permalink. Thanks for the news flash! Erik Agard, I wish you a long run on Jeopardy! I liked the puzzle, especially the clue for MOO (31A: [Don’t you think you’re milking it a bit too much?] The NW was the toughest part for me; hadn’t heard the term ECHO BOOMERS before. It was very enjoyable all around; thanks to both Eric and Bruce. Matthew RHYS still can’t crack the puzzle even after his Emmy win? Thanks for the clip of 1 WTC 1:1-2. There’s 47 more where that came from. 40a:BACH’s Well-Tempered Clavier is so canonical (no pun intended) that it’s been compared with the Bible — von Bülow called those two volumes the pianist’s “Old Testament” (Beethoven’s 32 piano sonatas being the “New”). Each volume consists of 24 prelude-and-fugue pairs, one in each major and minor key, in order up the keyboard from C major to B minor.